Unlike blogs hosted in such services as WordPress.com and Blogger.com, weblogs installed in your own server need regular checks and maintenance. Failing to do these checks can leave your blogs sluggish and even vulnerable to security problems. If you use WordPress to run your website, at the minimum, you need to be on the lookout for new releases (one has just been released as a write this) of the blogging engine. You also need to regularly check updates on such things as your theme and the plugins you are using. WORDPRESS BLOG CHECKLIST. My checklist for tasks related to running a WordPress site. click on photo to view larger image. I used to keep track of these tasks using an installation of activeCollab, an open source project management software that mimics Basecamp. With the recent Internet connectivity problems caused by that earthquake in Taiwan, I decided to track blog management-related tasks on paper. This way, I can prioritize whatever time I can spend online on really important tasks. I created this blog maintenance checklist as reminder of tasks I need to do as well as tracker of such things as version numbers of plugins and themes. I have a huge volume of spam comments in this blog and most are caught by Akismet. While Akismet deletes these comments after 15 days, I make it a point to delete them manually every time I log into my blog. This is why I included the deleting of spam comments in my daily tasks in the checklist. SPAM COUNT. If I skip just a day in deleting comments identified as spam by Akismet, the numbers hit the thousands. 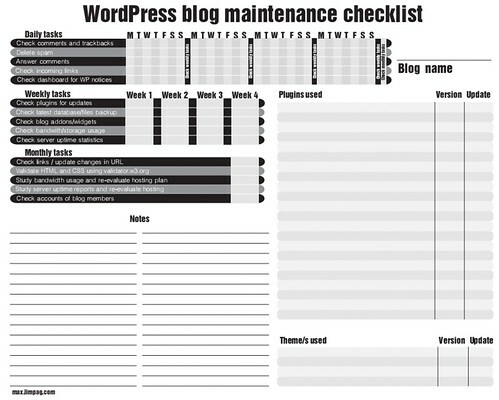 Click on the PDF icon to download the WordPress blog maintenance checklist. If you think there are other tasks that should be added to it, drop me a note and I’ll publish a new version. I also included in the regular tasks the checking of bandwidth and storage usage. My site was unavailable several times in the past because I exceeded my web hosting package’s bandwidth allocation. I used to think this was a “pleasant” problem because it means your traffic is increasing. It isn’t pleasant at all. In fact, it’s frustrating. The only way to guard against this is to monitor your bandwidth usage and be prepared to upgrade your plan if you consistently hit at least 90 percent of your hosting package’s bandwidth allocation. What other tasks do you think should be included in the list? Drop me a note and I’ll put up a new version of the checklist. Really impressive. Is this for a professional blogger because I hardly get to visit my blog everyday of the week? It’s for anyone who maintains a server installed WordPress blog. I’m also thinking of creating a more general checklist for bloggers. Nice layout, I was thinking of doing something like this in a spreadsheet, but I like this better. I started using your Notes area for a to-check-for-list; Looking for this that and another widget. have you tried Peter’s custom antispam image plugin? If you are thinking of starting your own world press blog, at IMSC hosting 1 click gets you started and the hosting is good value also with lots of free software. What authoring software did you use to design it? You might want to also check out Spring Cleaning or Fall Brush Off – Season Blog Cleaning and Website Development – Make a Schedule and Calendar. There’s a full list of frequent to-dos for blog maintenance. Thanks for the lead, I might try it out. What I’m thinking of trying is that plugin that randomizes your wp-comments with a unique key so that spam bots that target it can’t get through. I used Pagemaker to lay it out. Thanks for the tip. I’m still in the process of adding new tasks. I’ll be publishing a new version. Wow, that’s really thorough. Impressive. can I translate to italian and offer it to my readers at http://www.wordpressmania.it ? Sure! I’m planning to revise this. If you have suggestions on which tasks to include or exclude, feel free to e-mail me in this blog’s contact page or add the suggestions as a comment in this post. Thanks! Pingback: 25 Incredibly Useful WordPress Cheat Sheets & Checklists » De Web Times - Sharing Useful Resources. File is missing. But looks really good. Would love a copy.